Soup is one of the first and most common culinary creations in the world. It has long been used to comfort the sick, utilize leftovers from day to day meals, and warm us during the cold winter months. When is the perfect weather for soup? Always! Cool autumn days with leaves falling to the ground, leftovers from Thanksgiving become a delicious turkey noodle soup, and then everyone’s favorite, chili for the Super Bowl, and even those fragrant and flavorful chilled soups as spring rolls in. Growing up in New York we always had very cold winters and my Mom would make a lot of soups and stews. My mom was from Belfast so we would make a lot of barley soups, chicken soup, and beef stews. The aromas that came out of the kitchen while we were cooking and watching the snow fall outside warms my heart when I think about it. I always reflect fondly on those dishes because they remind me of times I spent in the kitchen cooking with her. When my paternal grandmother passed away I inherited her cookbooks. I was around 13 years old at the time and excited to be able to try out some of the recipes. One day I asked my dad, “What’s one of your favorite dishes?” He mentioned several things, but he had said Hungarian Goulash and I remembered seeing it in one of the cookbooks. I jumped and said, “That’s what I’ll make you for dinner tomorrow night!” I figured it was perfect as I had made my fair share of soups and stews with my mom. I have to say I’ve never really used a recipe per se. I usually use recipes as inspiration and do my own thing. However, being as young as I was and inexperienced with some of the spices (you don’t find an abundance of spices in Irish cooking), I should have followed the recipe. My poor father ate what I could only describe now as a plate of beef and paprika sludge, with a smile on his face, but I could see through the smile and over the years we have laughed about that meal. As I started my life in the commercial kitchen, soups were naturally one of the first things I learned to prepare. I really loved learning all of them from vegetable soups to creamy soups to consommés. Well, actually, I wasn’t very fond of consommés when I was younger; making the raft, making sure not to let it boil, it seemed like so much work. They can be quite tricky but once you get it down, there is nothing quite like a crystal clear consommé. You learn as you grow in the kitchen and just as for many things in life, good things are worth the wait. I love to partake of hearty soups in the fall and winter months. With the chilly weather upon us, I thought it would be the perfect time to share one of my favorite soup recipes, Tuscan Kale and Bean Soup. 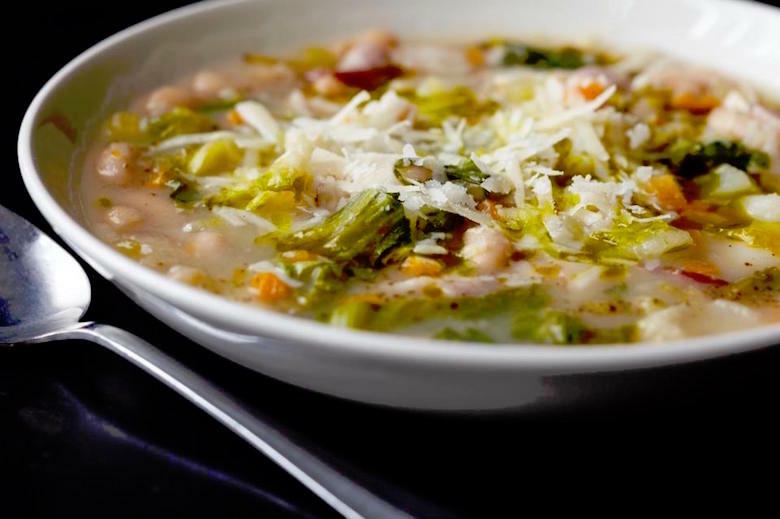 This soup is robust with vegetables, beans, chicken stock, and smoked bacon and then finished with a touch of extra virgin olive oil and freshly grated parmigiano-reggiano. This recipe will make a large batch for a gathering, however, it’s very easy to cut in half to prepare a smaller amount of soup. In a large Dutch oven or soup pot, add bacon and render fat over medium-high heat. Add mire poix and cook just until vegetables are translucent. Add in potatoes, beans, stock, kale, sage, and salt and pepper, to taste. Simmer just until vegetables are tender. Don’t overcook or over boil as the soup will become cloudy. Serve immediately, ladling into individual soup bowls. Drizzle each bowl with a little extra virgin olive oil and sprinkle with freshly grated parmigiano-reggiano. 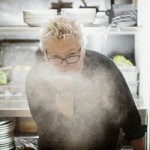 Chef Linda Harrell is chef/partner of Cibo e Beve Italian restaurant since 2011. 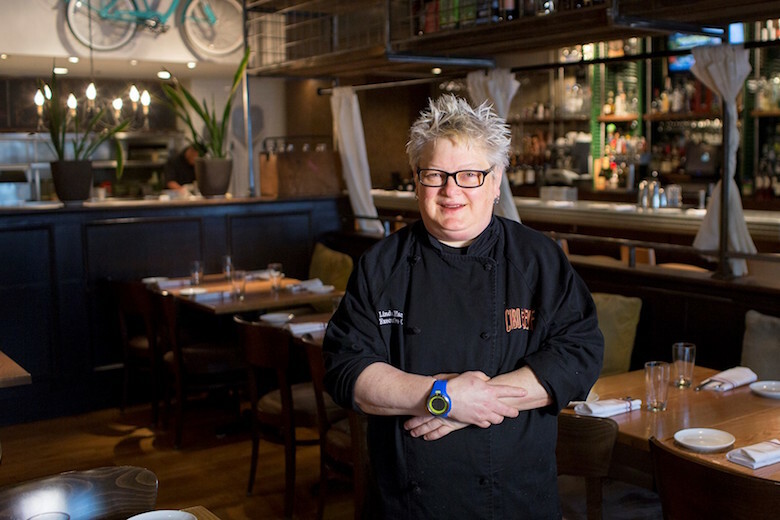 Chef Harrell began her career in 1984 when she completed an A.C.F. Accredited Apprenticeship Program. She trained at Kingsmill Resorts (owned by Anheuser Busch Co.) and worked as the Chef de Partie in the fine dining room, then known as the Riverview Room. She trained for two years under Daniel Yves Abid, who had trained under Roger Verge, Gaston Lenotre, and Alain Ducasse at the Hotel de Paris in Monaco. Harrell hit her stride at Les Clos de Marchands in Williamsburg, where she worked as Executive Chef for five years and was featured in Williamsburg Magazine’s “Top Ten Culinary Wizards” Issue. For the next eight years, Harrell worked as Executive Chef at Germano’s Trattoria Toscana in Baltimore, MD. She later left for Antica Posta in Atlanta, GA, where she contributed her culinary knowledge to the staff there before leaving to join 101 Concepts. Harrell has cooked at the prestigious James Beard House in New York City and was featured on ABC’s “Eat & Greet” show. Harrell was awarded the coveted "Celebrate the Chef" award from Springer Mountain Farms in which she was featured in a commercial for the all natural chicken farms. Linda also competed on the popular Food Network show "Beat Bobby Flay". Harrell has been featured in numerous periodicals such as Gourmet Magazine, The Atlanta Journal-Constitution, The Baltimore Sun, Baltimore Magazine, Flavors, and Atlanta Magazine. She is a member of Les Dames d’ Escoffier International and actively participates in demonstrations and benefits throughout the country. Say Goodbye to Bunkycooks and Hello to Pratesi Living!